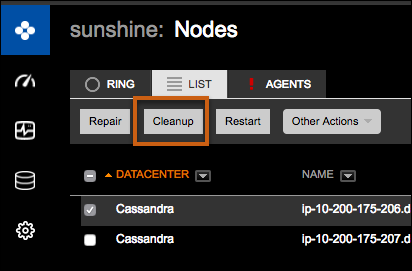 Run the Cleanup option to remove unwanted data after adding a new node to the cluster. For more information about manually running a cleanup, see the corresponding nodetool cleanup command. If OpsCenter role-based security is enabled, be sure that the permission for the Cleanup option in Node Operations is enabled for the appropriate user roles. Click Cleanup from the main actions bar. Tip: The Cleanup option is also available from the Actions menu in the Node Details dialog. The Choose a Keyspace dialog appears. Choose a keyspace and click Choose. 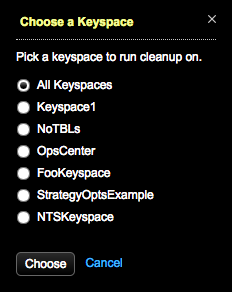 The Choose a Table dialog appears if not cleaning up all keyspaces. If applicable, select one or more tables and click Choose. The Run Cleanup dialog prompts you to confirm the operation. A message in the top banner indicates the cleanup is in progress. Click the Show Details link to view the progress in the Activities page General tab. The banner message indicates when the cleanup is done.